Giveaway, Excerpt, and Sale: Preorder “Blood and Ghosts” at 25% Off! 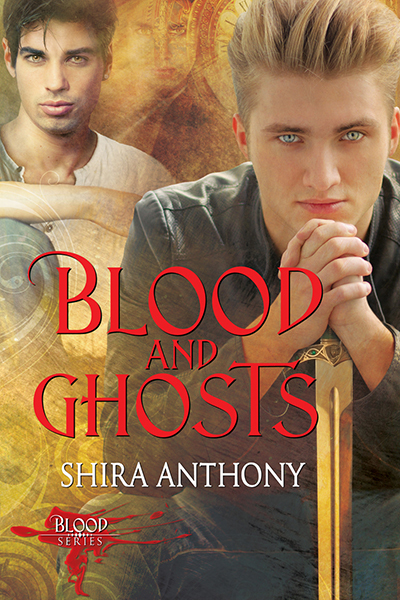 Today is cover reveal day for Blood and Ghosts (Blood #2)! And since Dreamspinner Press is running a great sale, you can preorder the book for 25% off. Haven’t read book #1, Blood and Rain, yet? That one’s also 25% off! There are three books planned in the Blood Series. For those of you who might have been putting off reading book #1 because it has a bit of a cliffhanger at the end, the second book ends with a HFN. And of course, you’ll find a HEA at the end of book #3. Three, HEAs, to be precise! The last book in the series, Blood and Eternity, will be released in early 2016. OMG, I’m such a fan of the Doctor, especially # 10, who said the wibbly wobbly timey wimey quote. I even have his sonic screwdriver, and my usb hub is a TARDIS with the flashing blue light and wheezing sounds every time you connect a device. Yeah, I’m a major geek, and so is my husband and all three of my kids, and my grandson will be following in our footsteps once he begins having footsteps – he’s only 8 weeks old, so it’ll be a while before he catches up. I love the mermen of Ea, and can’t wait for book three, which comes out a week before my birthday. Thanks for being awesome!! !